Just a few weeks after a polar vortex brought record-shattering cold to the tri-state, another blast of arctic winter weather is expected to freeze the region for nearly a week and dump up to half a foot of snow on the coast. Temperatures will tumble overnight after a mild day Monday, and 4 to 6 inches of fluffy snow are expected to begin falling by mid-morning Tuesday. The snow will continue through Wednesday along the coast from southern New Jersey to New York City and Long Island. The snow will be accompanied by highs in the low 20s and whipping, 35-mph gusts that will combine for bone-chilling cold. Wind chills could make it feel like it's below zero in some places Tuesday and Wednesday. 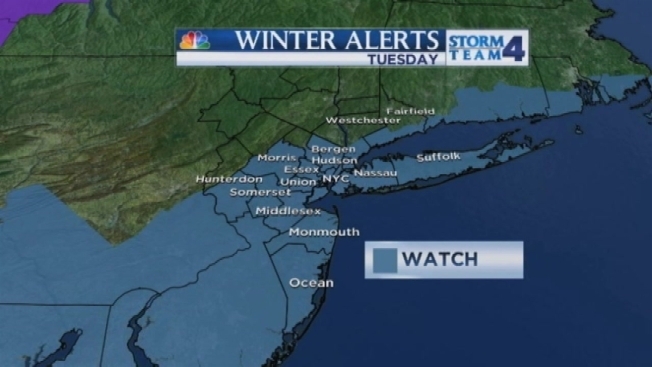 Winter storm watches have already been issued for areas along the coast in New Jersey, New York and Connecticut. Areas north and west of New York City could also see between 1 and 4 inches of snow. Get the latest forecast and track the weather with our interactive radar here. After the snow falls, temperatures will stay below freezing through Friday with highs in the upper teens and 20s. It is not expected to rise above freezing until Saturday.